BEAVERTON, Ore. – Beaverton Night Market returns on Saturday, Jul. 21 and Aug. 11 presenting a multicultural evening of international food and craft vendors, as well as cultural performances. Each market is from 5 to 10 p.m. and will be held at The Round located in downtown, just off the Beaverton Central MAX stop. Area residents from many regions of the world will share handmade crafts and goods representing their cultural roots. Visitors can sample delicacies from East Africa, Lebanon, Mexico, India, Vietnam and more! This year’s event also features an expanded footprint and an additional stage. Performances include Chinese Lion Dance, Mexican folkloric dance, Russian dance and theatre, and Indian/Latin DJ. In addition, kids’ activities, city information and community resources will round out the event. Admission is free. All vendors accept cash and some vendors will accept debit/credit cards. An ATM machine will be onsite near the Information Booth. Area parking for this event is limited. Alternate transportation is strongly encouraged. Vacant lots near The Round that were used for parking in previous event years are no longer available due to exciting downtown developments underway. SW Millikan Way will be closed from SW Rose Biggi to the parking garage entrance on SW Millikan Way from 4:30 to 10:30 p.m. to allow for pedestrian crossing. 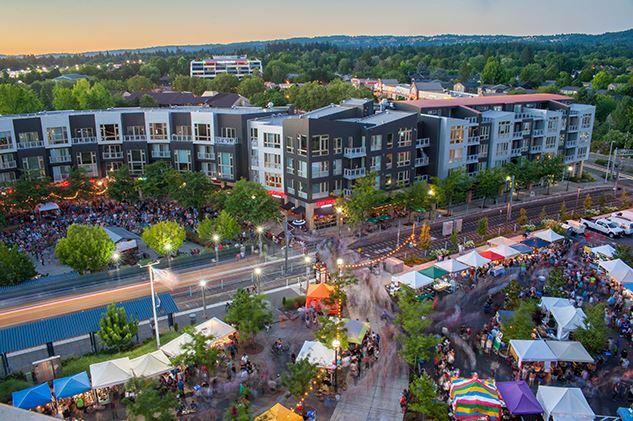 Offsite parking with free shuttle service from the Beaverton City Library and Beaverton High School will be available from 4:30 to 10:30 p.m.
Beaverton Night Market is hosted by the city’s Diversity Advisory Board (DAB) and is an action item in the Diversity, Equity & Inclusion Plan. This vibrant, intercultural event is reminiscent of night markets experienced internationally. For more information, visit www.BeavertonOregon.gov/NightMarket or www.facebook.com/events/1876626489223977Opens a New Window.. Previous PostPrevious Steampunk: An Art Invitational – Exhibit and Two Public Events! Next PostNext Mask & Mirror Wedding Auditions! Tony n’ Tina Return!